The site is an existing 5000 SF lot in a dense waterfront neighborhood of Scituate overlooking Third Cliff. The house is a year round home for a young family of four. Energy modeling was used extensively to design the house to be a cost effective approach to near net energy zero. The solar panels on the roof will provide +/- 70% of the heating, cooling and electrical load. The design reflects the traditional shingle style in the neighborhood and orients all living areas East, toward the Atlantic. The new structure is a simple 3 story home that maximizes views to the East while maintaining a small yard to the rear. 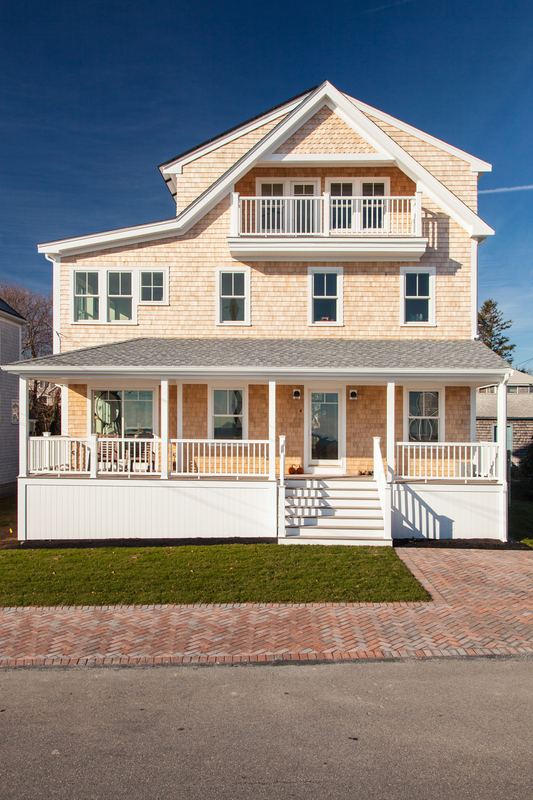 The front porch communicates with village streetscape, and the dramatic third floor deck commands a sweeping 180 degree view of the ocean. The kitchen-dining-living area on the first floor is a simple and relatively small open plan with a cozy den off the entry. Three bedrooms are located on the second level, again with views of the ocean. The 3rd floor contains an office and playroom with sloping ceilings that create an airy space with dramatic views.